A report into improving access to higher education among Suffolk’s diverse communities has been published by the county’s leading civil rights charity. The report shows that families who have recently arrived in the county struggle the most to make informed decisions around the educational opportunities that are open to their children. The manifestos represent the voices of these marginalised communities who are often the least listened to. 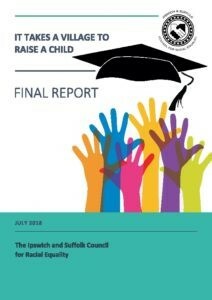 The Ipswich & Suffolk Council for Racial Equality (ISCRE) report – “It Takes a Village To Raise a Child” – is based on a series of one-to-one interviews and conversations with black and minority ethnic community members held at a sharing event earlier in the year. The research project was funded by The Network of East Anglian Collaborative Outreach (neaco) as part of the Take Your Place programme, which supports young people from target areas in their progression to higher education. The report demonstrates that recently settled groups, including those from Eastern European and the Roma communities, face the greatest barriers to higher education., Other longer established groups also reported problems in accessing information about higher educational pathways. The reasons for this are varied, but include a lack of community networks, certain cultural practices and assumptions and the lack of positive role models.